. : Lunar Palace v.5 - USA: Tuxedo Kamen :. Darien is Serena's love for all eternity. Darien lives alone in an apartment. When he was younger, he was in a car crash and developed complete amnesia. Darien is also known as King of the Earth, Prince Darien, and Tuxedo Mask. 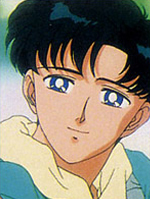 In Sailor Moon R, he appeared as Moonlight Knight.